Despite being DirecTV “Center Ice” subscribers, hockey fans in New York State and the greater NYC-metropolitan area continue to be forced to watch tailored MSG Network broadcasts according to their geographic location. When the Buffalo Sabres hosted the New York Rangers in Jack Eichel’s first home game in more than seven months Thursday night, fans in upstate New York were treated to the calls of Hall of Fame broadcaster Rick Jeanneret while those in the Big Apple, New Jersey and Connecticut caught all the action from the Rangers’ venerable play-by-play tandem of Sam Rosen and Joe Micheletti. It’s not that one tandem is better or more suited than the other; the issue is the geographic blackout imposed by MSG’s local television rights and DirecTV’s “Center Ice” package abiding by it. “Catch every slap shot, check and goal this season.” “Hear Your Announcers” is the NHL Center Ice slogan in 2016-17. “Full-strength” hockey coverage, however, it is not. As paid DirecTV subscribers, why is programming being dictated? MSG Networks expanded its single flagship channel to include MSG Plus as well as alternates MSG2, MSG Plus2 and MSG Plus3 — five separate channels — to accommodate the myriad of sports in the Empire State, which includes the NHL’s Sabres, Rangers, New York Islanders and New Jersey Devils, as well as the NBA’s New York Knicks. It has the ability to air both the Western New York and Tri-State feed. It chooses not to. The caveat in all of this for displaced Sabres fans wishing to hear Jeanneret, who at 74 years old, whittled down his coverage schedule to just 42 games this season, is that the networks — not us — decide what version we get. Why are Western New Yorkers living in the NYC-metropolitan area being punished? East of Rochester you get the Rangers on MSG. There is a population of 20.1 million people in the “Tri-State” and Buffalo Sports is already a proven TV-ratings giant, yet whenever Buffalo takes on any of the three metropolitan teams, Sabres’ game broadcasts are blacked out and fans cannot hear Jeanneret’s call. Many are simply muting their television broadcast entirely, watching the game action while listening in sync to WGR550’s live stream of the games online and that’s just not right. Who knows Kyle Okposo better than the New York Rangers? 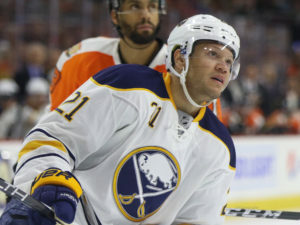 Okposo, who signed a seven-year, $42 million contract with the Buffalo Sabres on July 1, scored nine times and registered 12 assists and 21 points over the course of 37 career games as a member of the New York Islanders (2007-16) against the rival cross-town Rangers. Electing to listen to the call of the action from the New York-based play-by-play tandem of Sam Rosen and Joe Micheletti last night, each took a moment to compliment Okposo, not only paying respect to the Rangers-Islanders rivalry he helped fuel for over a decade, but also remarking on how well he’s lived up to his end of the bargain after joining the Buffalo Sabres through free agency. So excited to join the Sabres organization and the Buffalo community. Thanks for all the welcoming messages, can’t wait to get going! 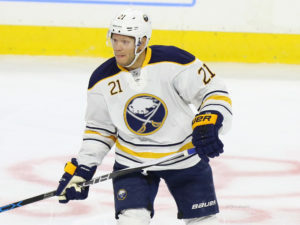 Appearing in all but one of the Sabres’ 23 games this season, Okposo has delivered to the tune of seven goals and nine assists for 16 points in his first 22 games in blue and gold. Three goals and 11 points have come on the power play, and he has fired 65 shots on goal. Over the course of a full season that projects to about a 27-goal, 35-assist, 62-point campaign from the power forward. Okposo, whom the Islanders made their first choice, 7th overall at the 2006 NHL Draft, has 146 goals and 385 points in 551 career games. His best season came in 2013-14 when he hit 27 goals and 42 assists for 69 points. 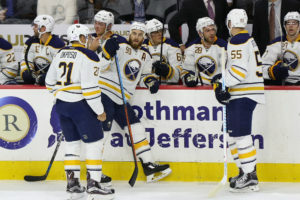 While Okposo has expressed frustration over the team’s 9-9-5 start, I believe the Sabres and its loyal fanbase would be happy with that projected return over a full season. And with the recent reinsertion of super sophomore Jack Eichel back into the lineup, I suspect his pace could see an uptick as Buffalo slowly returns to full strength. All in all, credit to the MSG Network team which also took the time to appeal to both markets including its interview with Niagara Falls native Adam Clendening in between the first two periods at Key Bank Center. Even if Sabres fans in the Tri-State weren’t able to listen to call from Rick Jeanneret, MSG appeased both of its markets even if there was a Jimmy Vesey dig or two. It only adds to the New York State rivalry. Now if only DirecTV would step up the plate and give fans what it pays for.